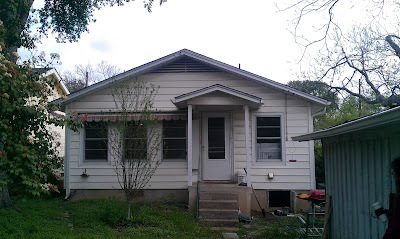 Here's a cool new project we're just starting in the Zilker neighborhood. We're rearranging the existing first floor to get the kitchen out of the middle of the house and connect it to the back yard, then adding a second floor master suite plus two bedrooms and a bath. We're giving up some of the conditioned area on the first floor to create a screened porch that will make the house live bigger and really connects the living spaces to the great backyard. The feature that adds the most bang for the buck might be the the new stairwell, which creates not one, but TWO new spaces that will help the house live large for a young family. At the bottom of the stairs, there's a great little nook for an office, and at the landing, a beautiful window seat for reading, napping, or even a spot for that extra overnight guest during SXSW. The kitchen is pretty cool, too. The existing kitchen got buried by an addition in the 70's. We're moving the kitchen to the back of the house to re-connect to the yard. There are a zillion old homes in Austin that got "remuddled" like this, and we're putting them back to right, one house at a time.